Do you ever think some people are just born as artists while others can barely draw a stick figure? Yeah, me too…which is a bummer for someone who loves art and loves creating. Growing up, I loved doodling and drawing puppies and horses, but my drawings were never as good as the “artistic” girl in the class. Oh what I would have done to have that natural ability, but I didn’t, so instead I put aside my crayons and paints and gave up on the creative side of me. Fast forward twenty years and the Paint & Sip concept is alive and rocking and rolling in the USA. By then, I was an entrepreneur but still had the same love of art (just wasn’t sure I could do it myself). I attended a paint and sip with my husband and daughter and we painted and American Flag on canvas. Van Gogh look out, I was amazed at what I walked out of there with. After 20 years of not even coloring, here I was holding a painting that I was so flipping proud of. I remember feeling like I was walking on water that day as I not only showed everyone that I saw my painting, but then I actually stuck all three of our paintings in the windows of our home (on the golf course) for the world to see. I was spellbound by the experience. When we walked into the studio that day, I had zero confidence in my artistic abilities and was even embarrassed to be attempting to paint….when I left I was pretty sure I could give Jackson Pollack a run for his money! LOL. I decided that day that I was going to open a paint & sip in my area. After calling around to attempt to franchise a shop, I was told there was not a market for this in my area and that I would not be allowed to by a franchise. So what did I do? I started my own paint and sip that eventually grew into seventeen franchised locations across five states. I hired artists and attended class after class and learned to paint…so much so that people started paying me to purchase my artwork. So much so that I was being asked to paint murals at local schools, businesses and homes. I eventually started teaching art classes and absolutely loved it. My business has helped tens of thousands of people to unleash their inner artist and be creative again, all while enjoying a fun time with friends. We have given artists the opportunity to do work that expresses their creativity but also spreads art to the world. Some of our students have gotten so good at art that they have become instructors and even studio owners. The ride has been amazing and I am so proud that when other people told me that I was not an artist, I did not listen. We are all artists-we can all create-and if that desire is in you then do it! If you want to paint, then paint! If you want to draw, draw! Don’t let anyone hold you back or put you down…some of the most famous artists in the world have artwork that I would never consider purchasing and some of the people that painted for the first time ever in our studio did such amazing work I would buy their art in a second. Art truly is in the eye of the beholder. Like all businesses, times change and new trends come along. 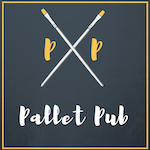 As time evolved and more people wanted to create more substantial pieces for their home, the DIY wood pallet movement was born, and in that, our new baby, The Pallet Pub. The pallet pub, like the paint and sip, will give people the opportunity to create more pieces that they are proud of to hang in their home and give as gifts. With our proprietary system, our guests will leave with artwork that they can loudly yell from the mountain tops, “I made this!.” Guests can choose any of our quotes and signs that they want to make, and can even make lazy susans, serving trays and more. Our shop on Main Street in Daytona Beach will be the spot for bachelorette parties, bridal showers, birthday parties, date nights, team building, girl’s night out and more. Want to create something besides a pallet? No worries, we will be rolling out a series of projects for both our locals and our tourists alike to enjoy creating. We hope that you will join us as we revitalize main street and revitalize the inner artist inside all of us. © 2019 The Pallet Pub | Design by: Abysmal Blue, Inc.